Depending on the temperature you set your water bath to and the amount of time you leave the meat in it, you can achieve a wide range of textures in the finished brisket. 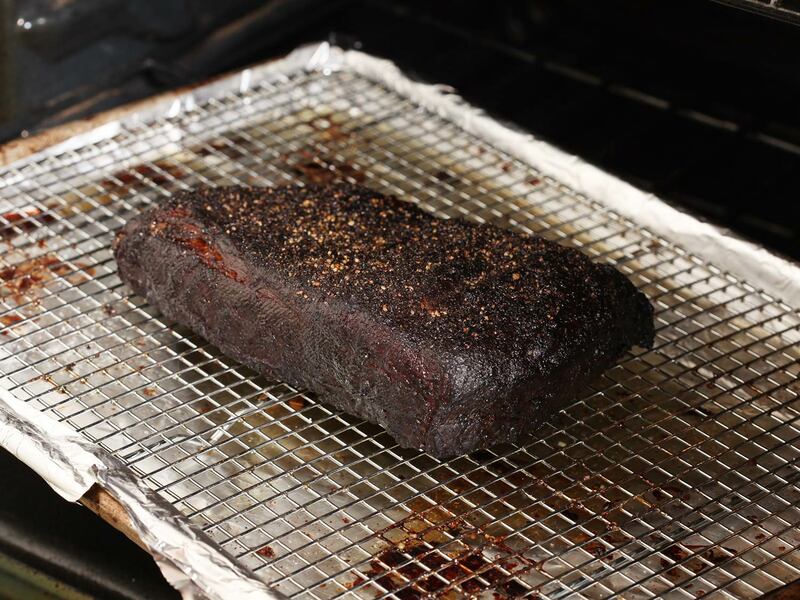 At 135°F / 57°C, brisket will never achieve the fall-apart texture of a traditionally barbecued brisket. Instead, it will soften while still retaining its structure. At 12 hours it's still quite tough. At 24, it it as tender as a New York strip steak. 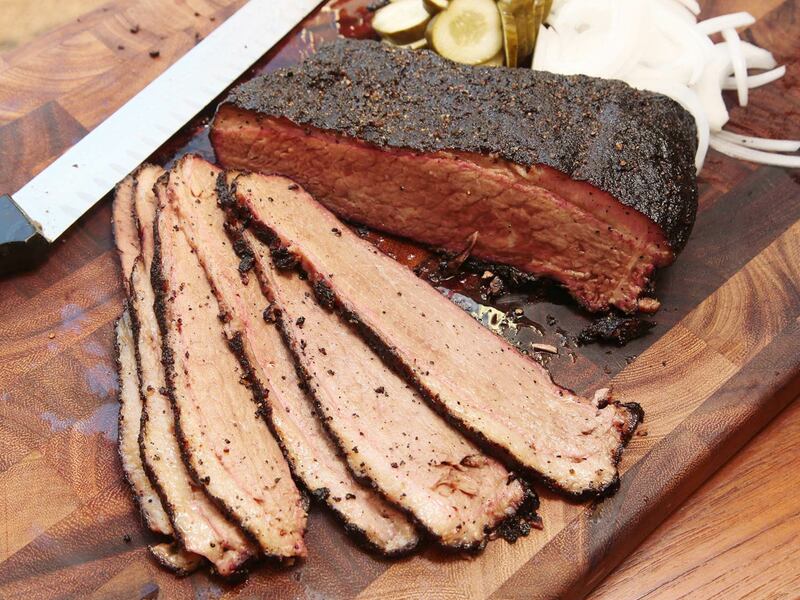 At 36 hours, it's even more tender, and by 72 hours, you'll have brisket that you can cut with a spoon, while still giving you a meaty bite and juicy texture. At 145°F / 63°C, the meat will just barely start to separate into a traditional brisket grain, but it will be a little dryer than at 135°F / 57ºC. This is sort of a temperature dead zone for me: too cool to significantly break down muscle fibers to the point that they shred like traditional brisket, but hot enough that the meat will dry out as it cooks. The fall-apart texture of brisket at 155°F / 68ºC for 36 hours. At 155°F / 68°C, we get much better results than at 145°F / 63ºC. Yes, the brisket will expel a lot of moisture as it cooks, but what it loses in water it gains in tenderness and moisture in the form of more connective tissue breaking down and fat rendering. For me, 155°F / 68ºC for between 24 and 36 hours is ideal. Start by grinding a half cup of whole black peppercorns using a burr grinder, a pepper mill, or a food processor. You're looking for a coarse grind, but not so coarse that identifiable peppercorns remain. 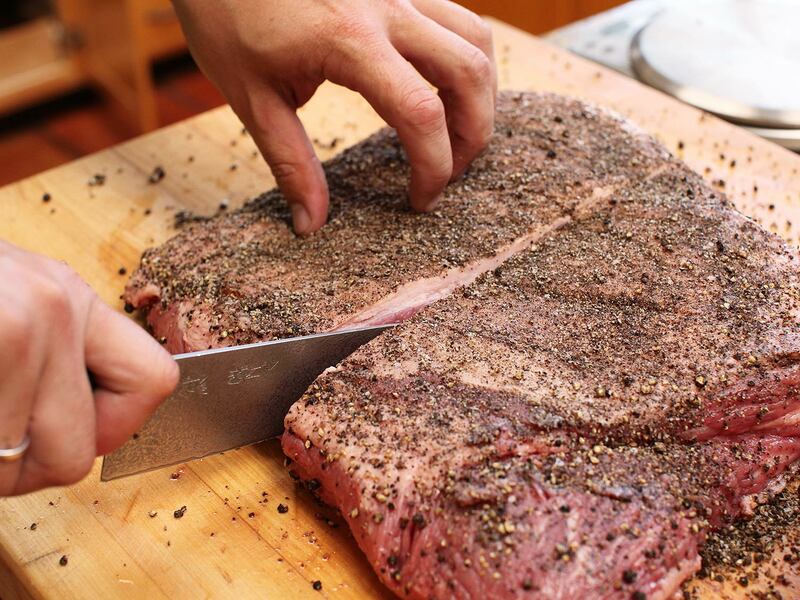 Combine the pepper with 1/4 cup of kosher salt and rub it evenly over every surface of the brisket. If you're using pink salt, add 1 tablespoon of pink salt (about 10 grams) to the rub before applying it. Chances are your brisket will be too large to fit in a single vacuum or resealable zipper locking bag. Split it in half crosswise to allow it to fit. 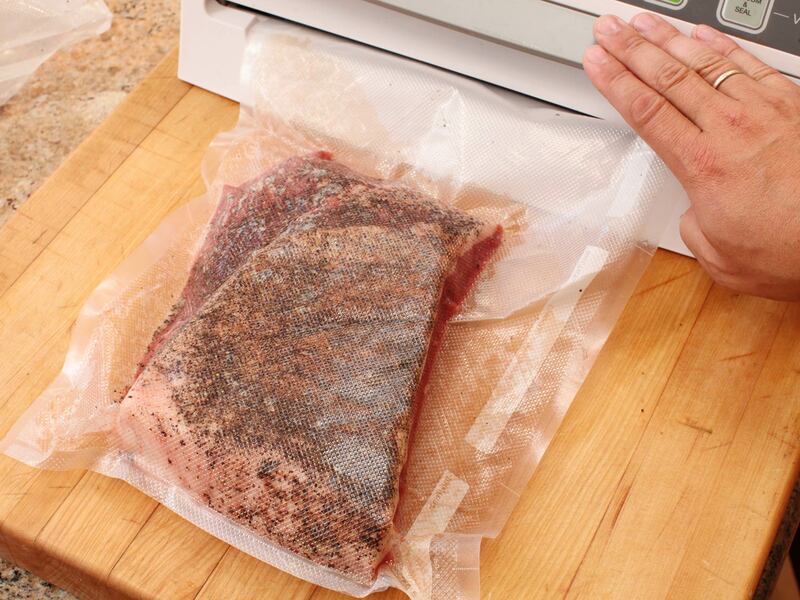 Place the brisket inside a vacuum sealer or resealable zipper locking bag. 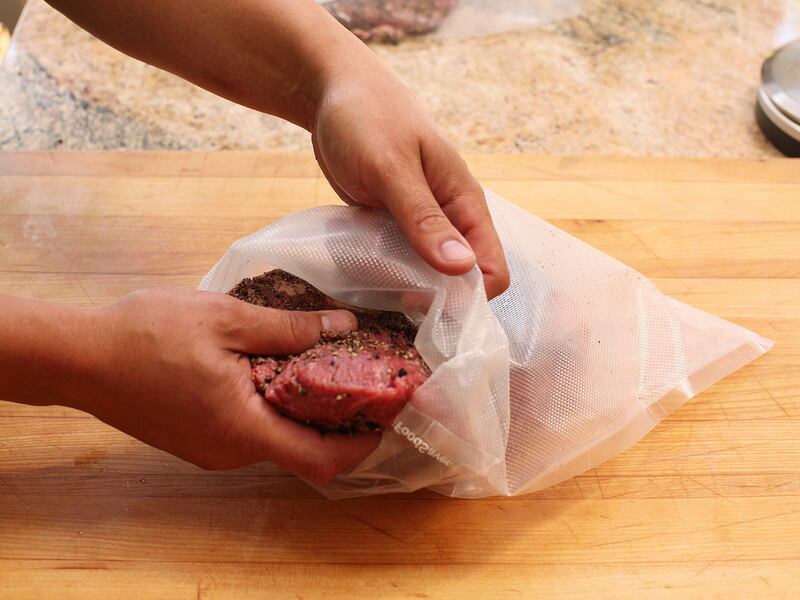 (Fold over the top while you add the meat so that no juices get on the edge of the bag, which can weaken the seal.) Add a half teaspoon (about 3g) of liquid smoke and to the bag if you're using the liquid smoke method. Don't worry much about distributing the liquid smoke evenly over the beef; it'll spread around during cooking no matter where you add it. 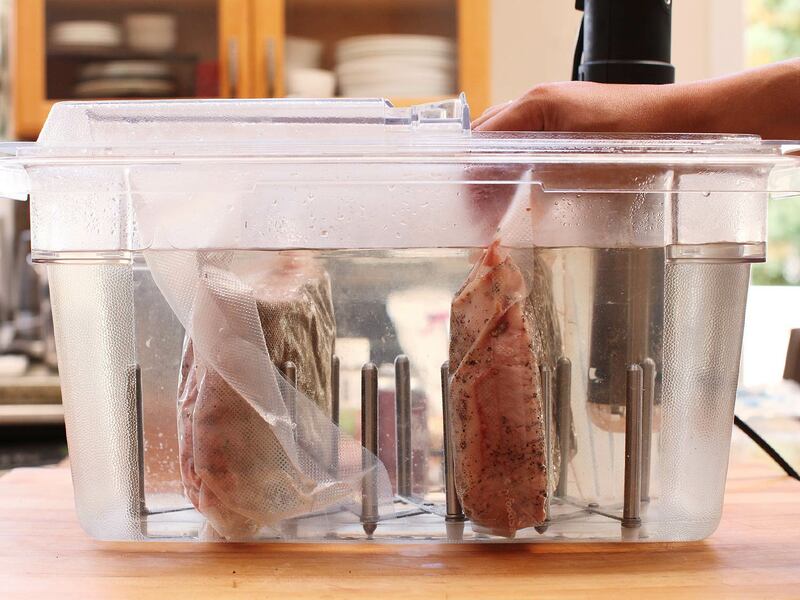 Seal the bag using a vacuum sealer. If using pink salt, let the beef rest for three to four hours in the refrigerator before proceeding. Set the temperature on your Precision Cooker to 155°F / 68ºC for traditionally moist and tender brisket, or for 135°F / 57ºC for brisket that has a meatier, more steak-like texture. 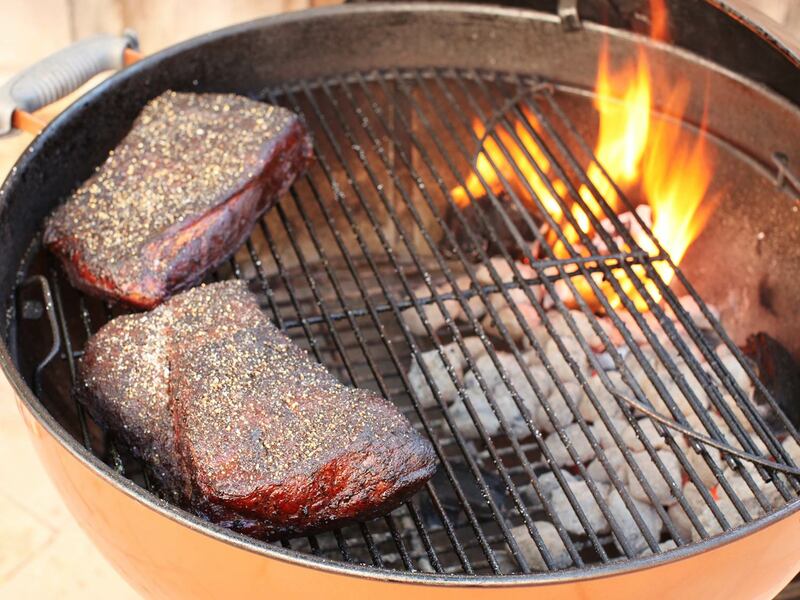 Add brisket to water bath and cover it with a lid, aluminum foil, or table tennis balls. Cook for 24 to 36 hours at 155°F or 36 to 72 hours at 135°F. When the brisket has finished cooking, remove from bags and carefully blot dry with paper towels. (Liquid from bags can be added to your favorite barbecue sauce and simmered down to provide extra flavor.) 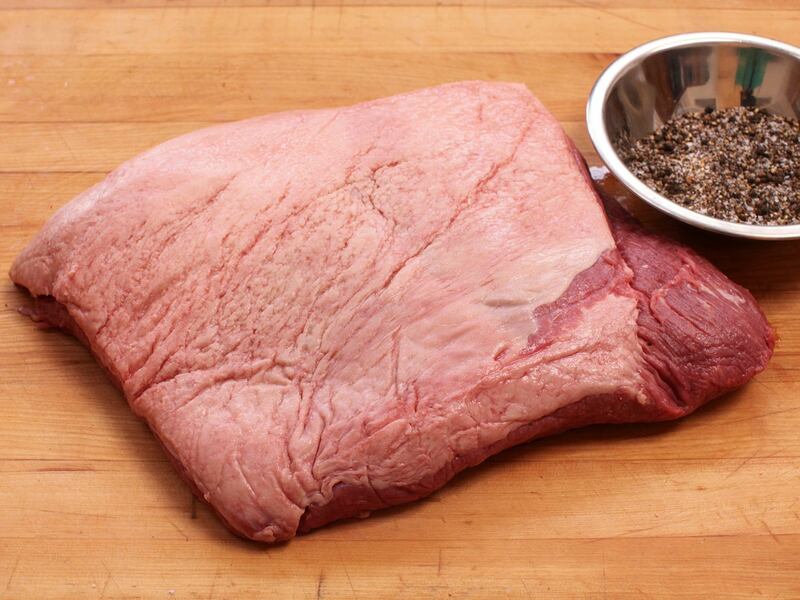 Allow cooked brisket to cool at least to room temperature before proceeding (an ice bath can speed up this process). 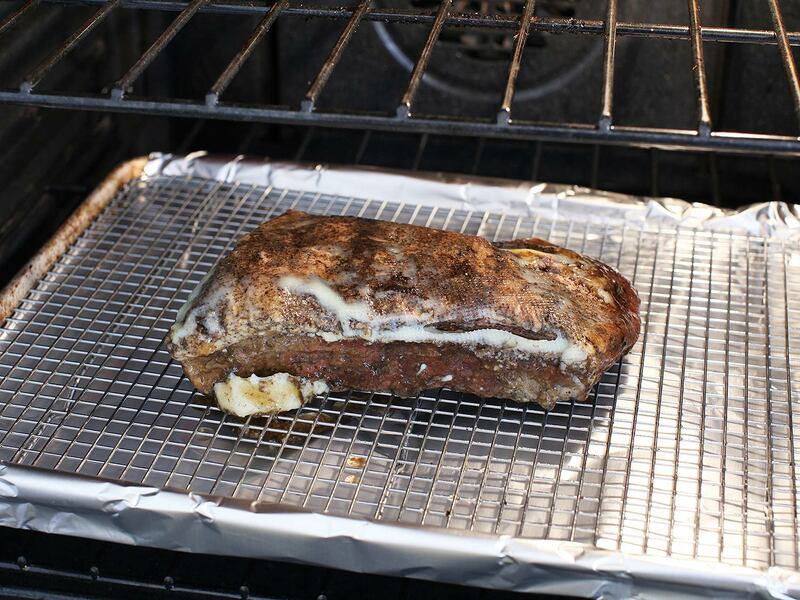 Brisket can be stored in the refrigerator at this stage for up to 1 week before finishing. Light 1/2 chimney full of charcoal. 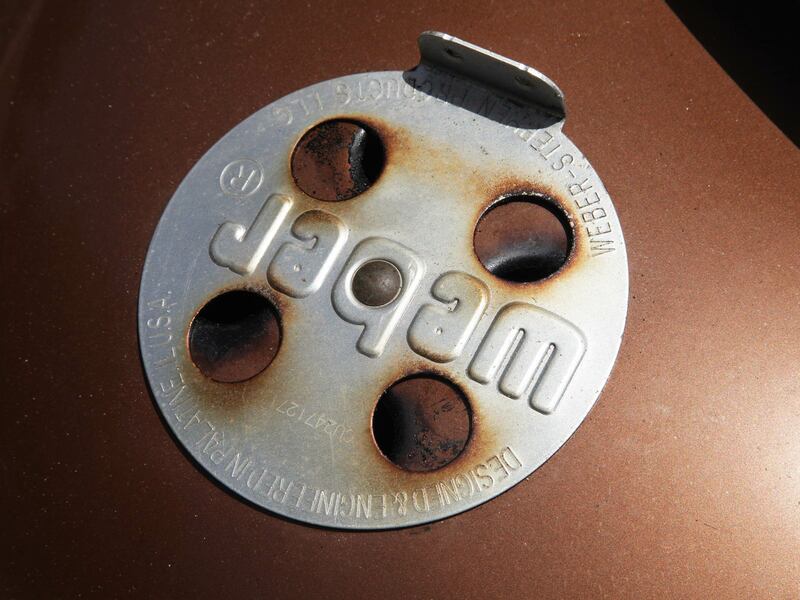 When all charcoal is lit and covered with gray ash, pour out and arrange coals on one side of charcoal grate. Set cooking grate in place, cover grill, and allow to preheat for 5 minutes. Alternatively, set half the burners on a gas grill to medium-high heat, cover, and preheat for 10 minutes. Clean and oil grilling grate. 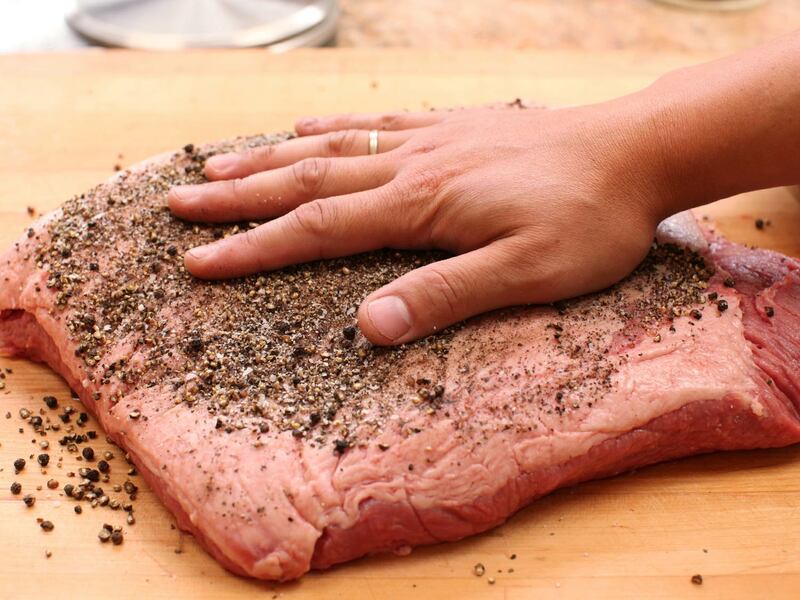 Rub reserved salt and pepper mixture into surface of brisket, then place it on cooler side of grill. Add 4 to 5 hardwood chunks to hotter side of grill. Cover and cook, adding a few pieces of wood and coals as necessary and maintaining the air intake valves to try and keep the cooker hovering at around 275- to 300°F at all times. Add 2 to 3 wood chunks twice during cooking. 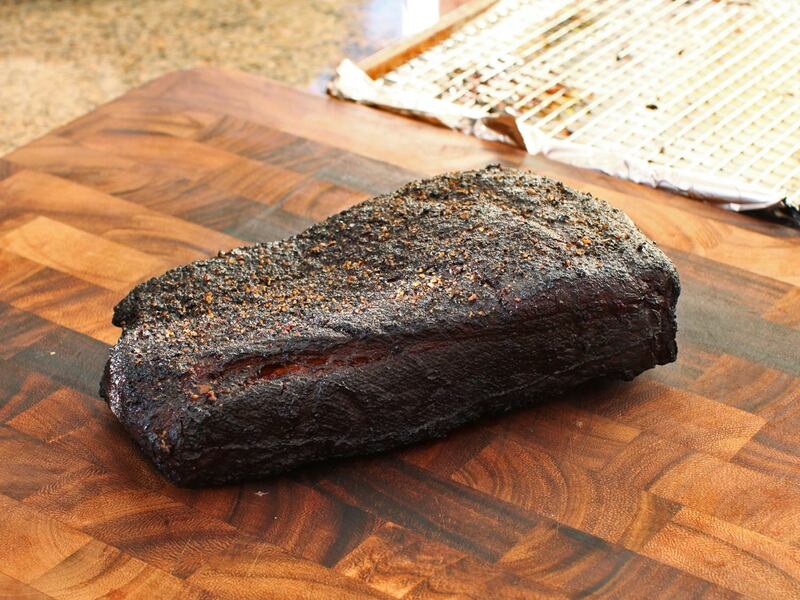 Keep cooking until the brisket has achieved a deep, dark, bark, about 3 hours. 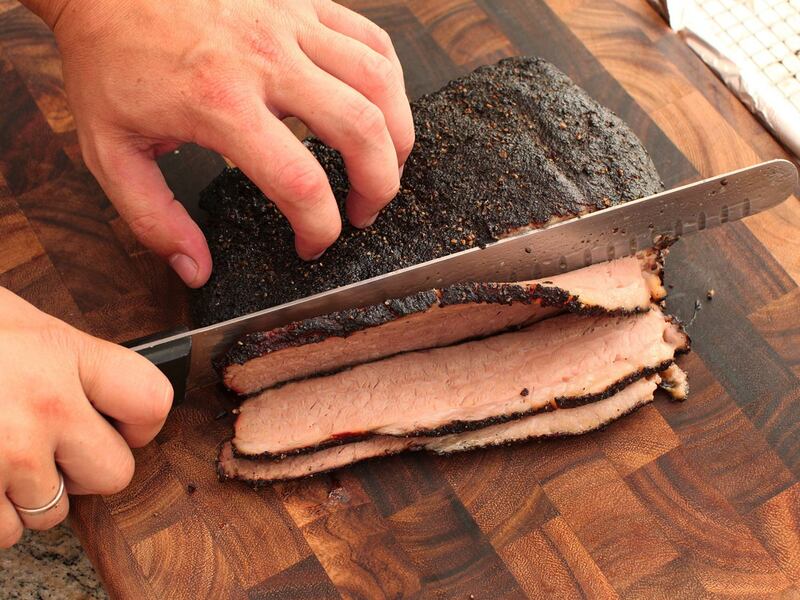 Transfer brisket to a cutting board and tent with foil. Allow to rest for 15 minutes. Slice against the grain into thin strips and serve. Adjust oven rack to lower-middle position and preheat oven to 300°F. If your oven has a convection setting, turn it on and adjust heat to 275°F instead. Rub reserved salt and pepper mixture into surface of brisket and place the on a foil-rimmed baking sheet with a wire rack placed in it. Cook until the exterior achieves a dark, mahogany bark, about 2 hours.